Stylus™, a music application specially designed for leading music streaming service Spotify, premiered as a fun, easy and exciting way for listeners to explore and discover the best of classic and contemporary jazz from among an essential database of over 1,200 titles. Stylus™ derives its name from its striking turntable-like graphics, which lend the app an authentic ambiance that jazz aficionados will recognize and appreciate. 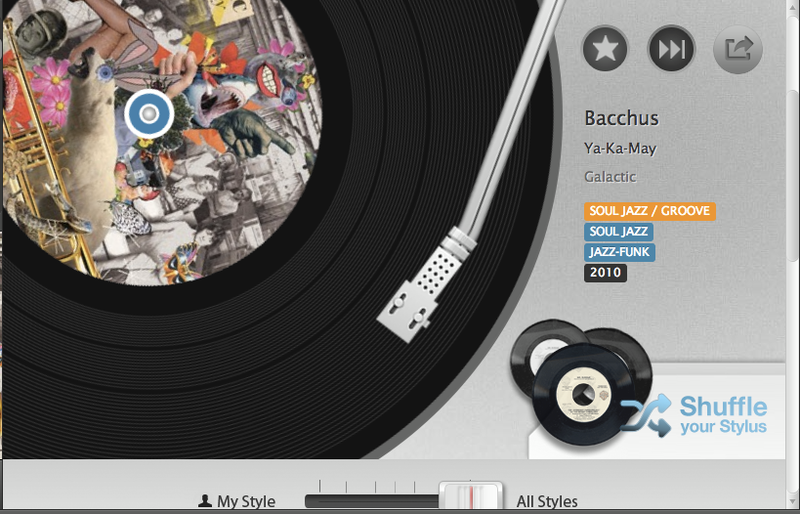 The clean, functional and interactive experience of Stylus™ is designed to guide users through the vast and often intimidating world of jazz. The app’s unique interface coupled with Spotify’s ‘star’ feature, smartly adapts to define and organize the listener’s personal taste. In addition, Stylus™ provides detailed artist bios, track information and cover art, further enhancing the user experience. Concord Music Group designed, developed and will maintain Stylus™; however the Stylus™ music library is pulled from a broad spectrum of the best jazz titles currently available on Spotify without regard to label affiliation. The initial Stylus™ collection of over 1,200 jazz titles features both essential and lesser known recordings from a wide range of subgenres such as big band/swing, bebop, jazz-fusion, vocal and contemporary jazz, among many others. Originators such as Louis Armstrong, Dizzy Gillespie, and Thelonious Monk, classic influencers like Charlie Parker, John Coltrane and Miles Davis along with modern-day stars such as Robert Glasper and Esperanza Spalding are all well represented. In addition, Concord is pleased to partner with the popular, influential music site iRock Jazz who will provide regular app updates of the most noteworthy groundbreaking jazz releases, while also serving as a co-marketing partner. iRock Jazz’s digital partnerships are as essential to the company’s ongoing success as the artists we cover. “[Digital] has been an essential part of how we build our brand and, connect with our readers, artists, and their fans.” “Innovation is our foundation, and we’re excited to be apart of this innovative app created by Concord for Spofity” said iRock Jazz founder John Moultrie. iRock Jazz is committed being one the best diverse, global online community; united by a common love for music, art, culture, technology and ideas. Users can access Stylus™ via the app tab on free and premium Spotify accounts. Concord Music Group, one of the world’s leading independent record companies, took home a total of eight GRAMMY awards at the most recent ceremony this past February, more than any other record label. Concord’s legendary family of imprints includes Concord Records, Concord Jazz, Fantasy, Stax, Hear Music, Milestone, Riverside, Specialty, Telarc, Peak, Heads Up, Prestige and Rounder Records.